Electronics - Phones - Cambridge Nostalgia & Co. - Retro Furniture, Gas Pumps, Games & More! A statement of style, grace and elegance. 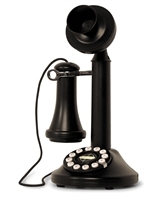 The 302 phone was introduced in 1937 and was the first in the collection to incorporate the bell in the base of the unit. Designed by Henry Dreyfuss and originally cast in metal, this piece was later produced using a heavy-duty plastic housing. The retro-style appearance is combined with a rugged construction earning it the nickname 'The Cow's Hoof' because of its lipped hoof-style base. This early desk version served as the standard for the better part of the World War II while telephone design efforts were halted due to defense work. Whether for its beauty or its brawn, the Crosley 302 Desk Phone is surely a conversation piece in any setting. Crosley's Kettle Classic Desk Phone captures the essence of the classic 1930's European-style telephone. This beauty was originally cast in a heavy-duty metal and then later reconditioned in a lightweight thermoplastic, giving it a more stylistic approach and curved design. This "fat style" phone features a substantial "hoof." True to the original, it also incorporates a mechanical bell in the base. The original desk phone was re-designed with this smart new look. The Princess introduced in 1959, was compact and attractive. With it's rounded edges, sleek lines and fashionable stylings, it's definitely a must have. 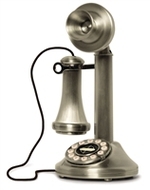 The Candlestick phone, also known as the "upright," initially became popular during the early 1900's before the introduction of the one-piece handset. From its bell-shaped mouthpiece to its cloth-covered receiver cord, this telephone replica recalls a vintage instrument from the 1900's. This modern day version of the Candlestick phone would have surely made Alexander Graham Bell proud. Introduced in the early 1920's, this classic features a crank handle that actually turns. This beauty is as functional as it is fabulous, and even includes a recipe-style compartment, volume controls for ringer and receiver and hold and speaker phone features. The Crosley 302 Phone returns to the wall in this Henry Dreyfuss tribute. Dreyfuss, considered a brilliant industrial designer, worked with Bell Telephone Laboratories designing telephones that would suit a variety of home environments. Well-known for the 302 Desk Phone, he later shifted his design efforts to include this wall unit that allowed consumers to walk with the phone while cradling it on their shoulder. This unified and balanced form replaced the awkward shapes of earlier models. Would you believe Dreyfuss actually used measurements from over 2,000 faces to determine the average distance between the mouth and ear? 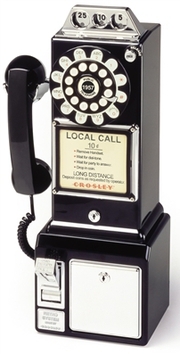 The Crosley 302 Wall Phone features the nostalgic rotary dial but actually functions with push button technology. No more waiting for that rotary dial to make its slow rotation. The very familiar 3-slot style pay phone was first introduced in the 1950's and remained virtually unchanged until 1965. This appropriately christened prepay-style pay station will take you back to the days of old fashioned phone booths and 10-cent phone calls. Believe it or not, its predecessor was a post pay-style phone that actually allowed the caller to place their call and then pay once finished. While you don't have to pay for your calls with this Crosley replica, you will enjoy the functional coin slots complete with jingle as your money is deposited into the coin bank in the base of the unit. We are constantly working to update our website with new product as it comes in. If you are looking for something specific but don't see it here, please contact us, either by phone: 519.740.6367, email: info@nostalgiaco.com or come visit us in the store.